I love to make pepper jelly and my friends and family love to eat pepper jelly – win-win. 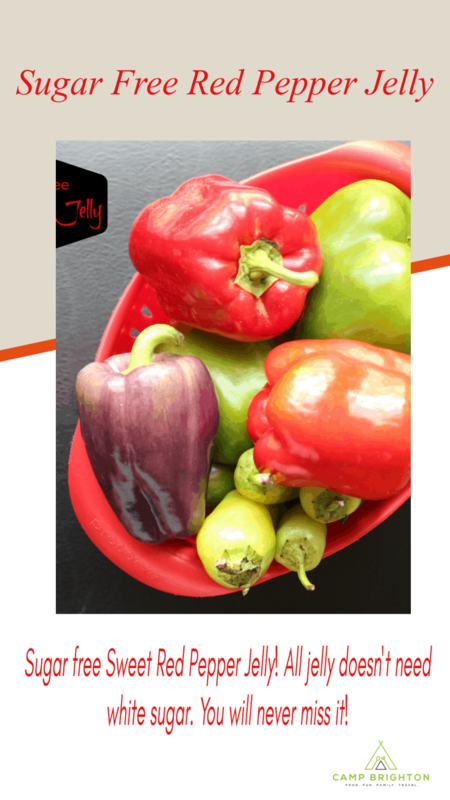 Around Christmas time, I love to gift small jars of red and green pepper jelly to friends and family. I was so excited to figure out that I could make a sweet red pepper jelly with no white sugar! If you have made jams or jellies before, maybe you have cringed a little as you pour in all that sugar! Ugh. I knew there had to be another way. Making this sweet red pepper jelly with no white sugar was almost as easy as making my usual hot pepper jelly, I just needed to do a few extra steps. The red peppers were a gift from a friend. I am sure that will make this jelly all the sweeter! 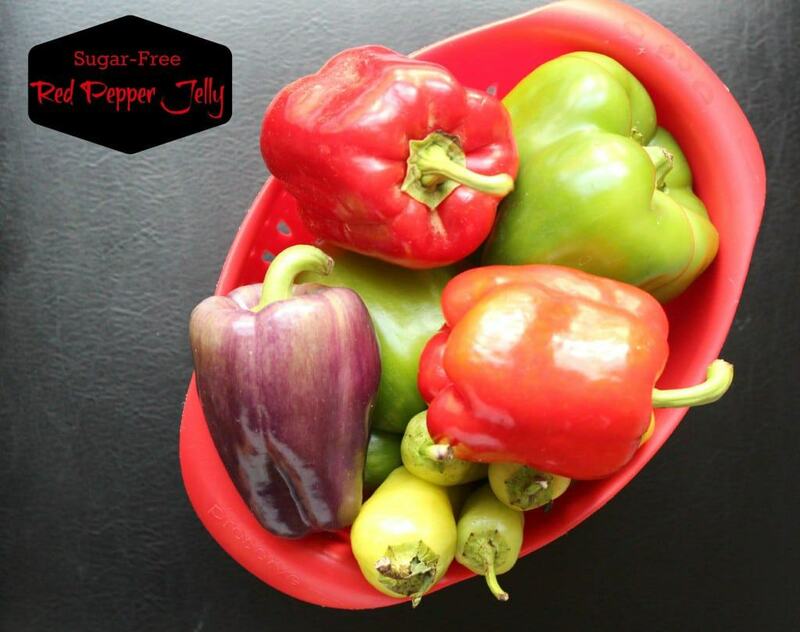 This year I decided to make my green pepper jelly the usual way – with a little spicy kick and a lot of sugar but I decided to try something a little bit different with my red pepper jelly – I wanted it to be sweet and I didn’t want to use any white sugar. Generally, when you use the regular Certo pectin, you need a lot of sugar to make the “jelling” action turn your lovely pepper puree into actual pepper jelly. 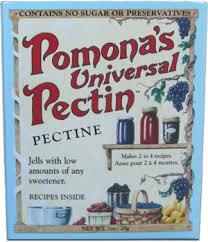 After a little searching, I came across Pomona’s Universal Pectin – a pectin that doesn’t require the use of any sugar. Bingo! 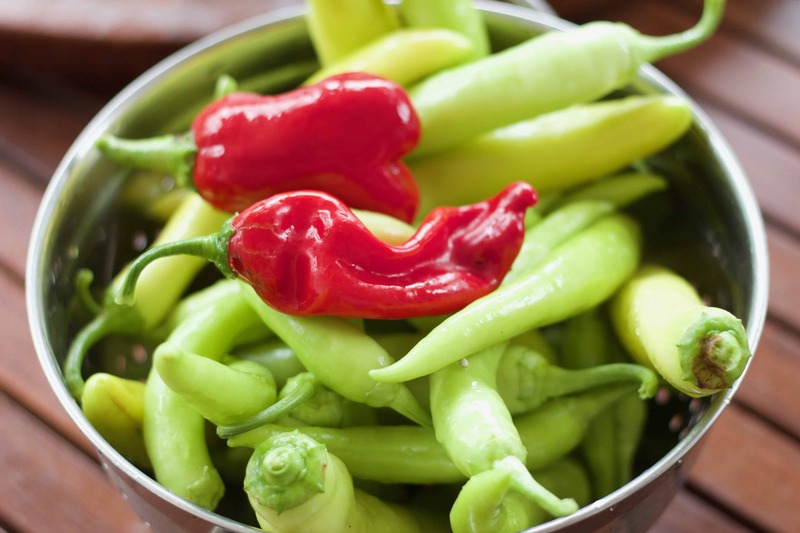 Peppers from my garden … so pretty! First, the box of Pomona’s Universal Pectin comes with two packets. One packet is the pectin and the other (smaller) packet is the calcium powder. Before you start the jelly process, you need to make some calcium water. Put 1/2 teaspoon white calcium powder and 1/2 cup water in a small clear jar with a lid. You can keep this jar of calcium water in your fridge for a couple of months and use it as needed. Preparing the Jars … This step can seem a little overwhelming – but as soon as you do it just once, you will realize that it’s not that hard! I wash my jars in the dishwasher right before I need them. Some people keep their jars on a cookie pan in the oven at 250 degrees. Sometimes I do this, sometimes I don’t. For the lids, I simmer the two piece lids in a pot of water on the stove – don’t let it boil. 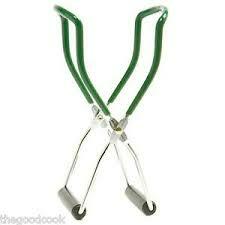 I keep them in the hot water until I need them and then pull them out as needed with tiny tongs. To boil the jars, bring a large pot of water to boil – you can put a canning rack in the bottom or a round cake cooling rack – this prevents the glass jars from touching the bottom of your pot directly. When the water comes to a boil, place the jars in the water – it’s best to use jar lifting tongs – they are only about $4 and they will prevent you from dropping glass jars or splashing boiling water on yourself. The water should be about an inch or so taller than the jars. Cover and let boil for 10-15 minutes. Carefully remove from the heat and place on a towel to cool. Preserving/Canning the Jelly … After you have filled the jars with red pepper jelly, leave a bit of headroom – basically not quite to the top – and then secure the two piece lids. You should boil the sealed jars of jelly for about 10 minutes. If I make a really small batch of jelly and I know that we are going to eat it in the next couple of weeks, I skip this step. However, if I am making a lot of jelly or giving it away for gifts, I boil the jars – you wouldn’t want your jelly to spoil after all this hard work! Enjoy! Sweet Red Pepper Jelly With No White Sugar! Red Pepper Jelly is one of my favorite ways to preserve extra peppers all year long and this recipe includes no white sugar! Combine 1/2 teaspoon of calcium powder with 1/2 cup of water. Shake and set aside. You only need 2 teaspoons - put the rest in the refrigerator for another time. 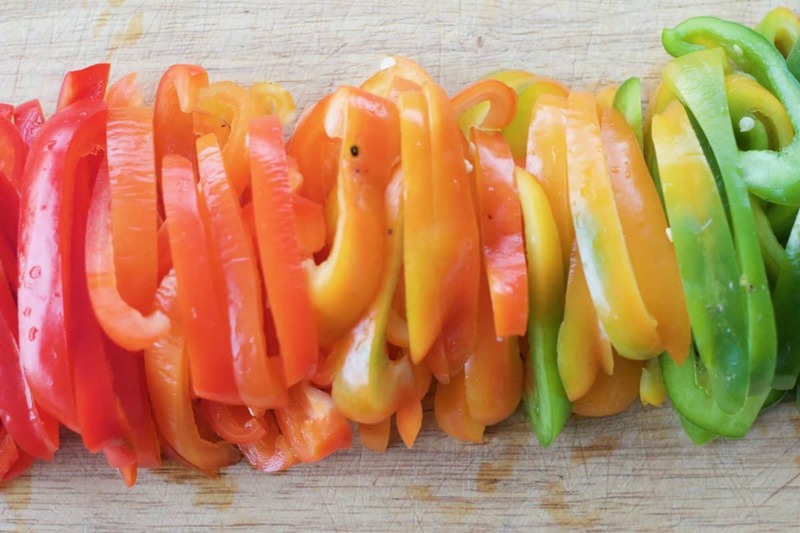 Finely chop peppers and put into a blender. Add 1 cup of apple cider vinegar. Puree. Put pureed peppers and the remaining 1/3 cup of apple cider vinegar into a large pot. Add only TWO TEASPOONS of the calcium water. Bring to a boil and simmer covered for about 5 minutes. Stir pectin powder into 1/2 cup of the honey until the pectin powder is dissolved. Add the remaining 1 cup of honey. Stir. Add the pectin-honey mixture into the pot. Bring to a boil. Stir vigorously for 1 to 2 minutes. Return to boil and remove from heat. Using a funnel, pour into prepared jars. Yum! I’m always looking for flavorful ways to dress up my ho-hum foods. I love the sweet-spicy combination, Erin…thanks for sharing! Thanks, Scott! Pepper jelly is definitely an easy way to add a flavorful kick to the usual fare! I was searching for a sugarless red pepper jelly recipe for my Community Kitchen group, they are hard to find, I am definitely going to use yours. Hi Dana! 6 half pints, roughly. this is the recipe I was looking for, thank you so much, but when do you add the calcium water? I adjusted the recipe above to clarify that! I’ve always wanted to make pepper jelly. Apple cider vinegar and honey are great additions. Thanks, Susan! We make it every year. Nothing is better than homemade jelly! I am glad you used natural sweetener here and am sure the honey gives it such a delicious flavor boost! Yum! Yes! As often as possible, I much prefer to use natural sweeteners! The honey really worked well in this. Would you believe that I have never tried pepper jelly before? You’ve convinced me to make it and try it! I think you are going to love it! My kids devour it and it always goes over well as gifts… I hope it’s a hit! Ok, I’ve been meaning to try and make pepper jelly without sugar and this gave me the push I needed! I love the stuff but hate that it’s so sugar laden. Can’t wait to try your recipe! can’t stomach Apple cider vinegar, can you use regular instead? I have not tried it with regular! I often substitute vinegars interchangeably but I honestly can’t say if this would work… If you try it, let me know! What is calcium water, and is it something I can make? Yes! You can make your own calcium water by mixing the calcium powder with water. The calcium powder comes in the box of pectin. I realized that I included that as a step above the actual recipe. Where do I find calcium water? The calcium powder comes in the box of pectin and you mix it with water to make the calcium water! How many carbs are in a tablespoon if the jelly? This is kind of a hard calculation. If I calculate the totals based on 2 lbs of peppers resulting in 6 pints of jelly and there are 32 tablespoons in a pint, you get less than 1 gram of sugar per serving.